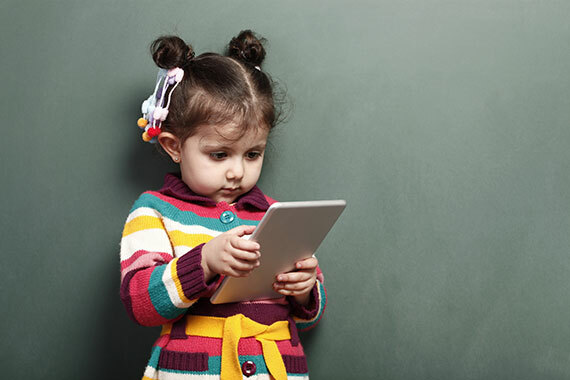 Young children learn best from carefully vetted apps and e-books. This article appears in the September 2013 issue of T.H.E. Journal. "Make no mistake about why these babies are here--they are here to replace us." At minimum, it sounds as if babies are ready to take on the four C's of the 21st century curriculum (creativity, critical thinking, communication, collaboration). Good news, again. While these nascent skills will form the foundations for all future learning, they require scaffolding and exercise to insure the viability of the foundation. With the inextricable link between technology and 21st century success, an ever-growing library of baby/toddler/preschool apps and e-books, and the ubiquity of tots holding tablets and phones, the inevitable question becomes this: How might we use these digital tools to best build those foundations? Currently, much of the data about young children and digital devices is device-oriented. As this literature review shows, several studies report on kids' average hours of screen time per day (2.2 to 4.6 hours for 2- to 5-year-olds); others reflect a strong and positive attitude about the educational value of digital devices among a majority of parents; still others confirm toddlers' and preschoolers' ability to demonstrate the requisite motor and cognitive skills for clicking, tapping, swiping (at the older ages), and navigating through experiences of interest. Unfortunately, we know less about the efficacy of the content or experience to deliver on the software's educational promises. While a few studies in the literature review above show students improving in certain skill areas after using particular pieces of software, a set of generalizable rules, hallmarks, and features that might guide early educators' choices is scant. One study that does examine user experience looks at the design of the clickable hot spots found in most children's interactive experiences. The findings suggest that when hot spots support, reinforce, or extend the e-story children are reading, the children are better able to retell the story. Extraneous or incidental "bells and whistles" had the opposite effect. While the former approach is quite common, more than likely as an educator, you are not surprised to learn that extraneous information, regardless of its entertainment value, can sabotage a well-constructed lesson. In the context of the paucity of interactive content research, the point of this example is to illustrate that as educators, armed only with your instincts and knowledge of best practices, you can identify the resource best suited to any given learning goal and learner. With that in mind, and with reinforcement from the vast archive of early childhood research literature that suggests that playing, exploring, and experimenting with open-ended materials (as well as building concepts through direct experience with people and objects) are essential for healthy growth and development, here are some guidelines for navigating the landscape of 21st century digital early learning. In order to be in the best possible position to effectively "replace" us, today's children must be active learners who can readily go beyond producing the right short answer to knowing where, when, why, and how to apply information. Yet, the majority of today's digital experiences stop short, simply offering countless opportunities to identify, catch, and capture letters, shapes, numbers, and colors. Many, perhaps in an effort to prepare early learners for life in an agrarian society, also focus on naming favorite barnyard animals and noises. Since the foundations of and attitudes toward learning are forged during the early years, it's essential that a child's digital learning play is built on more than naming things and receiving "good job" rewards, no matter how charmingly animated. When considering skill-building products in math or language, for example, look for digital equivalents of math manipulatives, such as Tangrams HD by Visual Learning Aids, that allow the child to play with math concepts; or seek out storytelling props that invite language play, such as Sock Puppets. Classic toys such as dolls, blocks, balls, and role-playing sets (play kitchen, work bench, garage/roadway--all gender stereotypes aside) are familiar learning tools in many preschool and pre-preschool environments. In addition to providing opportunities to exercise certain motor skills, these types of materials are dependable standards for nurturing social, language, and a range of problem solving skills. Many of the digital counterparts for these activities, however, are right-answer oriented, rather than allowing for truly open-ended play and exploration. Look for play experiences that avoid rigid rules, allow for exploration, and offer more than sound effects and easy cleanup, such as the Balls app by Iotic. While hands-on interactions with objects and people in the real world are generally considered the preferred way for young children to learn, it's hard to resist the allure of a child at peace with a tablet. A myriad of electronic "paint" and music-making products promise countless hours of creative play. Look for those that, like a master arts teacher, can provoke a little exploration that may lead to a deeper understanding of how to build a piece of music or create an image to express an idea. A good example is Singing Fingers, an iPad app developed at MIT that lets the users finger-paint sounds (including their voice) on the screen, then play and explore the graphic musically. Try to determine how readily these virtual explorations come off the screen and onto the floor, into the room, or on the walls through conversation, display, or live performance. And keep in mind that even the most profound curriculum or magical material is best served when there's a teacher, parent, or mentor to guide, interpret, narrate, scaffold, or extend the experience. Despite the complexities of an increasingly digital world, it's often best to keep it simple. Regardless of the child's real world experience--from ducks to fire trucks--or the specific curricular goal, teachers can always just gather their group around the glow of the screen, do an image search, and compare, contrast, describe, and imagine away. As early educators evaluate and wend their way through the mountain of apps, games, and digital "solutions," just remember that it's not about what technology can deliver, but what the child takes away.